Full Disclosure: All GHOST® products feature a 100% transparent label that fully discloses the dose of each active ingredient. Zero proprietary blends means you know what you’re getting in each and every scoop. 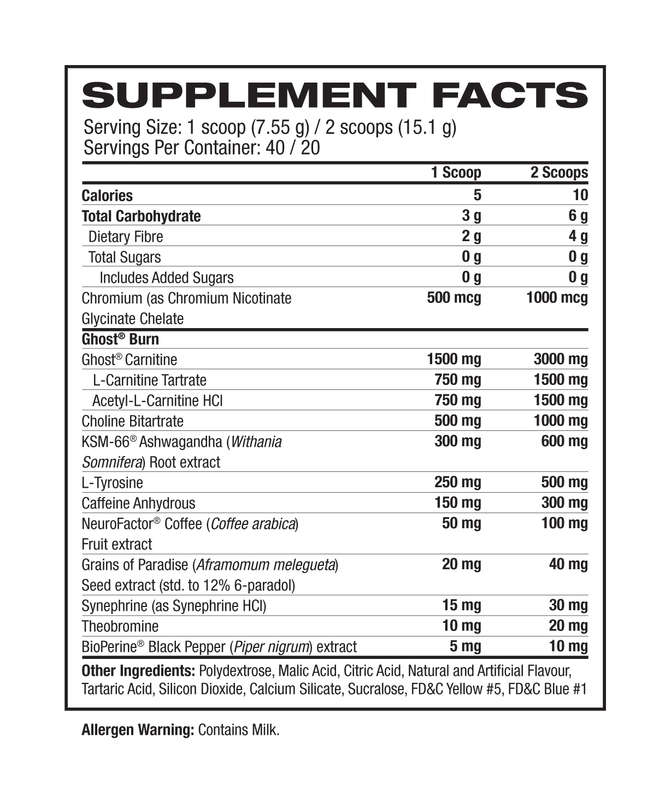 GHOST Carnitine 3g: Carnitine has been widely researched in several doses (1-3 Grams) and forms but in our opinion, the best clinical data regarding fatty acid oxidation, reducing catabolism and free radical formation has been on L-Carnitine Tartrate, with Acetyl-L-Carnitine having additional or more clear cognitive benefits. While the combination of the two hasn't been specifically studied, we think it's a no-brainer and wanted to deliver the best of both worlds in GHOST® Burn. KSM-66 Ashwagandha 600MG: KSM-66® Ashwagandha is a full-spectrum extract with the highest concentration of all major root-only extracts available on the market today. It works as an adaptogen and has been shown to reduce stress, anxiety and cortisol levels, plus it has 14 years of R&D and 22 clinical trials behind it…yeah, it’s pretty awesome. 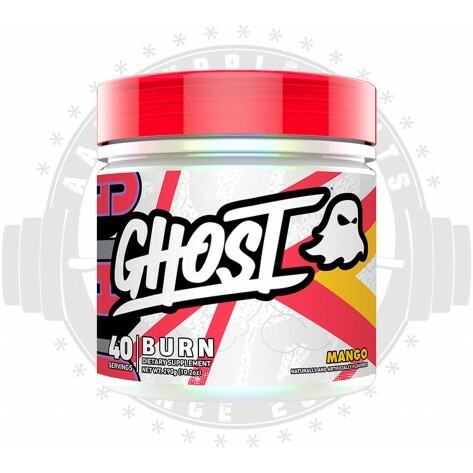 Caffeine Anhydrous 300MG: Caffeine junkies rejoice...GHOST® Burn is loaded with 300MG of Caffeine per 2-scoop serving (150MG per scoop). NeuroFactor™: NeuroFactor™ is an all-natural, patented extract of the whole fruit (including the bean) of the coffee plant that has been clinically studied to boost brain and cognitive function in ways your morning cup of coffee can only dream of. Grains of Paradise: Grains of Paradise is a spice with a similar makeup as Ginger that has been shown to increase overall energy expenditure and mobilize brown adipose (fat) tissue. In other words, it’s a pretty epic (non-stimulant) fat burning ingredient and a must-add when constructing GHOST® Burn.